Return To "Browse by State"
Finding a good college education that doesn’t break the bank can be tricky, especially if you don’t know where to look. Luckily, several nationwide and statewide programs exist to help pay for college, and you don't have to be a genius or demonstrate financial need to qualify for all of them, either. Florida provides many state-funded scholarship programs, including the Bright Futures Scholarship, that award millions of financial aid dollars to eligible high-school graduates each year. Additionally, public and private organizations offer Florida residents a range of scholarships and grants based on merit, interest, and economic background. What kinds of financial aid are you eligible for, and what can you do to apply? We’ll walk you through the steps every Florida student should take to fund a college education. Regardless of the state you live in or where you plan on attending college, your financial aid journey begins with the FAFSA, which stands for Free Application for Federal Student Aid. Admittedly, this form can be a headache to fill out. However, enduring FAFSA is your first major step to securing financial aid. Award letters will be sent out after you have received your college acceptance letter, but that doesn’t mean you should wait to apply. In fact, applying early could put you in the running for important scholarships and grants that have application deadlines. If you experience any trouble with the FAFSA, don’t hesitate to seek out help! We’ve also created a helpful guide to answer any questions you may have about the process. As mentioned above, the FAFSA puts you in the running for some state grants and scholarships. In addition, the Florida Financial Aid Application (FFAA) can qualify you for even more. Don’t worry—this form is much shorter than the FAFSA (it’s only one page! ), and much easier to fill out. Like the FAFSA, it is important to file the FFAA sooner rather than later to increase your chances of qualifying for grants and scholarships with deadlines. That being said, if you have yet to file a FFAA—don’t stress! Applying late is better than not applying at all. In fact, the Bright Futures Scholarship, one of Florida’s most widely available scholarships, accepts completed FFAA forms until August 31 after high school graduation, so as long as you submit the application by this date you will still be considered for the award. Bright Futures Scholarship is a merit-based scholarship open to all Florida high school graduates (as long as you submit the FFAA). Bright Futures is not limited to students pursuing a college education, and also funds additional postsecondary schooling such as technological institutions. Benacquisto Scholarship Program is for Florida National Merit Scholars. This award is merit-based and covers full tuition apart from that covered by the Bright Futures Scholarship and the National Merit award. National Merit Scholars will automatically be considered for this scholarship. Jose Marti Scholarship Challenge Grant is for students of Hispanic origin who demonstrate financial need. Mary McLoed Bethune (MMB) Scholarship is for Florida undergraduates enrolled in a minimum of 12 credit hours per semester at one of the four Florida institutions: Bethune-Cookman University, Edward Waters College, Florida A&M University, or Florida Memorial College. The award is merit-based and qualifiers must meet additional scholastic and financial need requirements defined by the individual institution. Rosewood Family Scholarship is for students directly related to the Rosewood families, who suffered from a racially motivated massacre that took place in Levy County, Florida, in January 1923. A maximum of 50 applicants receive this scholarship per year, and money can be used towards tuition at Florida state universities, public community colleges, and public post-secondary vocational-technical schools. Scholarships for Children and Spouses of Deceased or Disabled Veterans provides funds for veterans and their family members. Amounts vary based on which title you hold, and what university you are looking at. Access to Better Learning Education (ABLE) Grant for undergraduate students enrolled in a minimum of 12 credit hours per semester at private Florida universities and colleges and not pursuing a degree in theology or divinity. First Generation Matching Grant (FGMG) Program for first-generation college students enrolled in a minimum of six credit hours per semester at participating Florida institutions, and demonstrating substantial financial need. Florida Resident Access Grant (FRAG) Program for Florida undergraduates enrolled in a minimum of 12 credit hours per semester at participating private or nonprofit institutions and not pursuing a degree in theology or divinity. Visit FloridaStudentFinancialAid.org to learn more about Florida’s Department of Education and view the full list of scholarships and grants. For current high school students, it’s always a good idea to set up regular check-ins with your high school guidance counselor to stay up-to-date on local scholarships. Try putting a reminder in your phone so that you don’t forget to schedule an appointment. Conducting your own online searches is also beneficial. Many public and private colleges in Florida offer scholarships, so be sure to search on school websites or call their financial aid offices. You never know what you can find once you start clicking. FloridaCommunity.com provides a long list of both merit and need-based scholarships for Florida residents, and you can check out more major or interest-specific scholarships here. Think about your interests. Are you pursuing a degree in the Arts? Maybe you are considering joining ROTC. Interest-specific scholarships and programs may give you the extra financial boost you need to fund your college experience. If you’ve exhausted all your options for grants, scholarships, and federal loans, a private loan can help you make up the difference that you’ll need to fund your education. 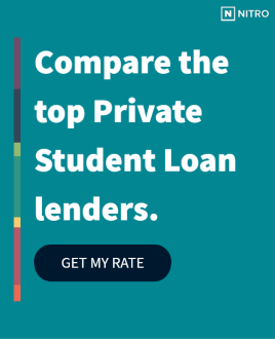 Click here to see the best banks for a private student loans. Check out our free NitroScore tool to get a better idea of the size of loan you need, and which of our highly vetted loan partners can offer you the best rate. Simply enter a college and major to find out your total costs, your salary after graduation, potential loans needed, and a score that tells you how easy those loans will be to repay based on your projected salary. You can then customize the results with info about scholarships, grants and savings — and even compare different college/major combinations. Florida residents shouldn’t have to pay for college alone. Check out some of the resources here and start planning for your future today.